The bougainvillea is one of several desert plants that I recommend for people who want desert shrubs or bushes that are perennial (you need to plant them only once), hardy, low care, relatively drought resistant, easy to find, pretty cheap to buy, and provide lovely color many times during the year. Locally, you will most often hear bougainvillea pronounced: bo-gun-vee-ya. The botanical name for bougainvillea is Nyctaginaceae. 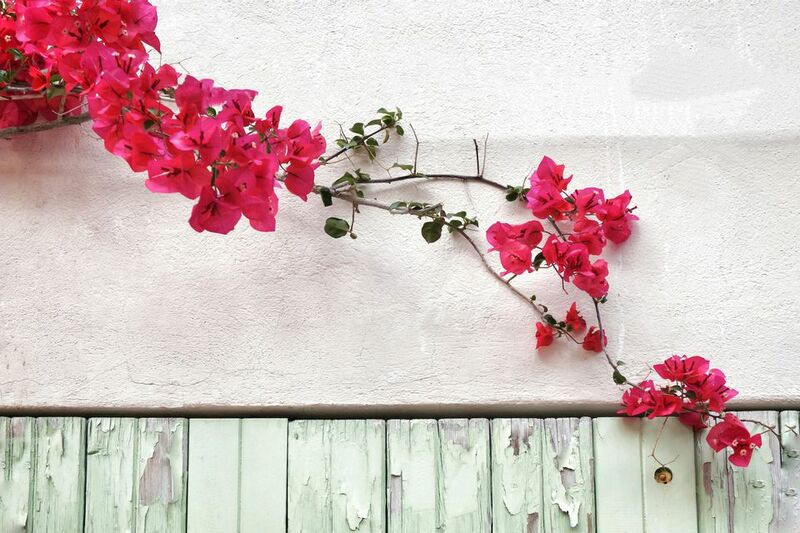 Common mispellings for the bougainvillea include: bogainvillea, bougainvillia, bouganvillea and bougainvilla. Sometimes you'll hear the plural of bougainvillea stated as bougainvilleas. Bougainvillea are evergreen desert woody vines that flower several times throughout the year. The most common colors of bougainvillea that you'll see in the Phoenix area are magenta, purple, pink and red. The bougainvillea would like a little shade during the day, but it will be fine in full sun. Bougainvillea plants can be trained into various shapes. They can be used as vines, shaped into bushes, into ground cover, or just let to grow wild. Of all the desert plants I recommend, bougainvillea is the one that is most sensitive to frost, and there will be times during the winter when you should cover your bougainvillea with a light cloth or sheet. Even if the bougainvillea plant dies in the frost, it will probably come back after the winter if it is pruned, but it looks pretty ugly when it is frost damaged until that time. Unless you have a lot of space to let it grow wild, bougainvillea will need periodic trimming. Don't be afraid to cut it way back. Be careful when pruning your bougainvillea plants -- they have thorns and they aren't easy to handle! One last thing about bougainvillea: they are dirty. That means that you'll have red bracts (those are the leaves that turn red that make it so pretty) everywhere. Don't put a bougainvillea next to a pool unless you are prepared for constant cleaning.